Runners who are starting to think more competitively about their running will always look for ways to gain that extra edge on the competition. Racing to discover a new pre-run fuel, a workout that promises to better equip your body to work harder or even a wearable that can coach you to get faster. When it comes to metrics, most runners are satisfied by being governed by the basics – but if you want more data, you can certainly have it. Running watches and wearables are churning out more stats than ever and one that is starting to gather momentum is running power. We already pinned it in our 50 big predictions for wearable tech in 2018 as being one of the big trends for the year. So now it's time to see what all the fuss it about. What does running with power actually mean? Can it actually make a difference? We try our best to debunk all you need to know about running with power and running power meters that make it happen. That is the big question. If you're into your cycling, then you may well be familiar with the concept of power as a metric and the concept of power meters. Essentially, it's the idea of measuring work rate or performance to offer insights into fitness levels and the effectiveness of your training. That power is shown in watts and for cycling can be measured by devices, fitted onto various parts of a bike including the pedals or the crank arm. "In its simplest terms, power is work rate: It's the measurement of how much work you are doing and the rate of speed (how fast) you are doing it. You already have an innate sense of what power means from your training: you know, for example, that the faster you run over a given distance, the greater your power output must be to accomplish the work generating speed." Vance says that power is the measurement of how much work you are doing and the rate of speed (how fast) at which you are doing it. He also starts talking a lot about formulas, which look like they are straight out of an algebra text book, but ultimately this is just another way for runners to measure performance. With this single metric, the aim is to get you running better and help you make the most of your training. To achieve running faster times, nail pacing during races and also improve running form with the ability to record and analyse additional metrics like vertical oscillation and cadence. The folks at Stryd, who are in the business of making running power meters, put power for runners into context in race terms. They talk about the idea of following a targeted power number at the beginning of a race and sticking with that number to nail your PB. It feels like a metric that is built for the elite and serious runners, but with companies like Garmin now tapping into the concept of power, it could start finding some fans lower down the running food chain. So what do you need to run with power? Unlike cycling, options are not too widespread just yet. But there are a couple of setups to choose from right now to get you started. The most popular comes courtesy of Stryd, who first started with a heart rate monitor chest strap-style device. It's since moved to a foot pod sensor that clips onto your laces where it can deliver richer running analytics to produce the power estimates. Using various motion sensors packed into the foot pod, Stryd's setup is able to record metrics indoors and outdoors including pace, distance, cadence, ground time, vertical oscillation and leg spring stiffness, translating that data into one single metric known as power. While the data is being recorded down below, you can view the data in real-time from your wrist, specifically a number of sports watches. That includes the Apple Watch Series 3 and 2, and a host of Garmin watches including the Forerunner 935 and Fenix 5X. It also works with Suunto's Ambit and Spartan watches and Polar's V800. It will work with smartphones too (iOS and Android) and is compatible with training platforms like Zwift. 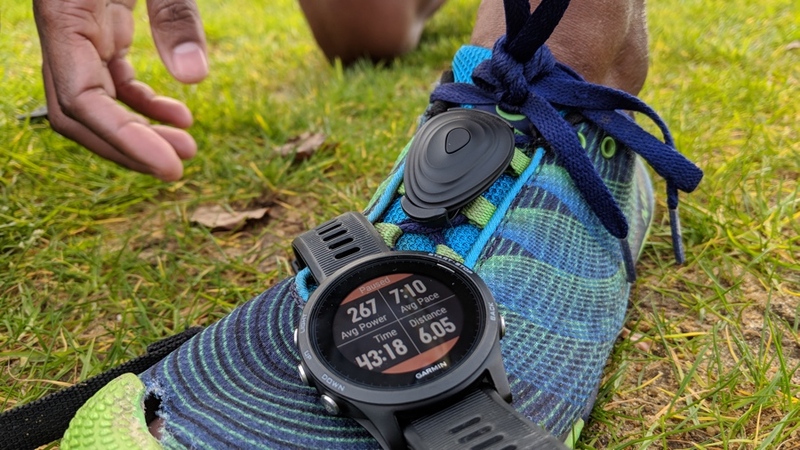 The other running power meter option is to go Garmin all in and use its own Running Power app (available from the Connect IQ Store) with one of its newest Forerunner and Fenix watches. You'll also need its Running Dynamics Pod or one of its heart rate monitor chest straps to provide the data in a similar way that Stryd's setup does. So we've broken down what power means in terms of running, the supposed benefits of running with power and the kit you need to make it happen. The real question here is: does running with power actually work? Here's the running with power take from a power meter newbie (that's me) and a running with power convert. "I started learning about the idea of running power meters about a year ago when I discovered the first generation Stryd. I'm certainly no elite athlete, but I'm definitely open to any new tech that can promise to help me run better race times. "When I got hold of that first gen Stryd, Jim Vance's Run With Power book arrived alongside it. I've attempted to finish the book twice and failed both times. The concept of running with power is no doubt fascinating and I'm definitely intrigued, but that book was a tall order to digest. "Then Garmin announced its own Running Power app and I got my hands on the second generation Stryd and decided to give it another try. Based on the book, I've spent the first few weeks simply running and not bothering about the numbers displayed on my Forerunner 935. But telling me not to look at the data has had the reverse effect. I always want to look at the numbers. "What I see from those numbers feels very similar to the concept of heart rate based training, focusing on one metric to make the most of your running sessions. The difference being here is that there's far more being analysed from a foot pod than a heart rate chest strap, at least from a runner's perspective. While I've not seen any initial benefits in terms of running form aside from focusing a little more on getting my cadence where it needs to be, being mindful of that watt data on my watch has had some impact on keeping my pace more focused. "I'm willing to give power meters more time to win me over, but I can't help feeling like I'd need more assistance from someone that knows about running power to get the most out of it." "I use power as a pacing metric to train and race because it gives me a better read on my effort levels. A power meter for running is measuring your movement in three planes, vertical, horizontal and lateral. Using 3D micro accelerometers, some very fast computer processing and some complex maths to compute the Newtonian physics, which is Power = Force (Mass x Acceleration) x Velocity. "Training to power has allowed me to accurately compare kilometre (or mile) splits on my run and between runs when running on varied terrain where your pace should be adjusted to maintain a consistent effort throughout. That means my power number can be the same for a km uphill and a km downhill when I'm putting in a consistent effort making it much easier to compare and be motivated by my performance on both splits. Heart rate – the only other alternative metric that can be effective at measuring effort – can change depending on my stress levels, eating habits and other external factors, whereas power is more consistent. "For me, power has helped make a couple of big changes to my training and racing. Firstly, I now run uphill slower and downhill faster – it is hard to do in races when everyone else is running to pace. Secondly, it's really helped improve my self-confidence and motivation in training when I'm running up low gradients thinking my pace is off and I'm not fit and helps me maintain a more consistent mindset whilst running, just like the metric that's being measured."